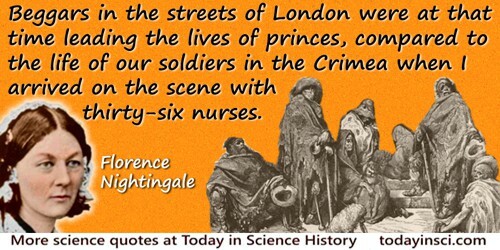 Beggars in the streets of London were at that time leading the lives of princes, compared to the life of our soldiers in the Crimea when I arrived on the scene with thirty-six nurses. As quoted in ‘Little Chats With Big People’, The Scrap Book (Jan 1908), 5, No. 1, 43.